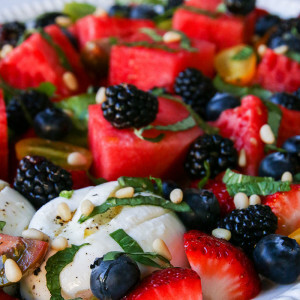 In the dog days of summer, we all are looking for fast, easy and light meals. Kabobs are a natural choice, as you can create entire meals on a stick by mixing protein and vegetables. This is one of my favorite kabob combinations. It is not quite a one-dish meal, but add a simple green salad such as Butter lettuce salad with fines herbs and walnut oil dressing or peach and warm goat cheese salad and you are good to go. Threading strips of prosciutto between your kabob ingredients accomplishes two things. First, the prosciutto adds tremendous flavor. Second, the fat in prosciutto moisturizes the meat and helps prevent it from drying out. Remember, prosciutto is a cousin to bacon. And we all know everything is better with a little bacon. My French Bulldog, Chubby, definitely subscribes to this concept. Ever since I slow cooked a batch of Pulled pork for 12 hours, Chubby can't resist the smell of pork. Doesn't matter if it is pork chops, bacon, prosciutto or Pork Spiedies. As soon as the pork comes out, Chubby is by my side crying for a taste. There are two other things I do to keep the chicken moist. First, I marinate the chicken. Even just 30 minutes in the marinade helps, but you can marinate the chicken for a couple days if you want really flavorful, moist chicken. 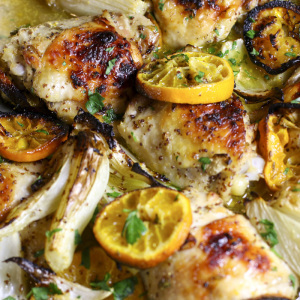 There is a health bonus to marinating chicken and meat before you grill. Marinating protects against forming HCA's, which are carcinogens. See my post to learn 13 grilling tips to reduce HCA's and PAH's. The second thing I do is I use chicken thighs. Americans are the only culinary culture that prefers breast meat. Most of the world prefers thigh meat. I think it is due to our misguided aversion to fat. See my post for more on why I prefer thighs to breasts. Bonus: chicken thighs are cheaper than breasts and will help stretch your food budget. Do you hate the way the meat on your skewers spin when you try and flip them on the grill? There are two answers to this problem. 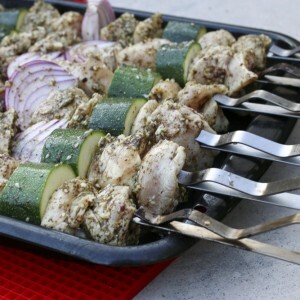 One is to buy my favorite flat-blade metal skewers that hold the ingredients on your kabobs firmly making it very easy to flip and cook your kabobs evenly. These awesome skewers will last forever. The other answer is to double skewer your ingredients with two skewers so there is a definite front and back side to your kabobs. If you are using bamboo skewers don't forget to pre-soak them so the bamboo doesn't burn. These skewers look delicious! Definitely going to be making the recipe.. pinned! Thank you Thalia. 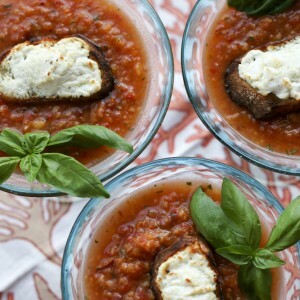 They are simple and good, my favorite kind of recipe!